Did everyone manage to get through my recap post of Vogue Knitting Live? It was quite the doozy, wasn't it? And that wasn't even everything!! Well, I had meant to post the lowdown on my VK Live haul earlier this week but I've been distracted and busy by other things regarding family. So here's a quickie on the goods. I really hope no one got amped up about what I got, because really, it's not a big deal. I didn't go hog wild in the Marketplace, and I didn't get massive amounts of yarn. I had to show some real restraint because my budget didn't allow for a free-for-all so I really had to think about each and every purchase. Like I mentioned before, I didn't arrive at VK Live with a list of yarns that I was in the market for, like I normally do for events that involve yarn. Instead I had set a goal of purchasing only yarns that I have never used before and either weren't readily available to me locally, were hard to find online, or were yarns that I wanted to see and touch in person before I made the decision as to whether or not to purchase them. I'm actually a little surprised that I didn't get more variety of yarn from various places, even though I fondled manhandled had my eye on several new-to-me brands and different fibres. Most of my haul is from Hazel Knits. Their booth was insanely gorgeous and so full colour that I had a really hard time staying away. So instead of fighting it, I decided to just go with it. Ultimately, I knew that I had to make it mine. If I didn't, I would have gone home and from time to time think about "the skein that got away". Does anyone else get like that with a particularly beautiful skein of yarn, or is it just me? I have no plans or even an idea as to what I'm going to do with it yet. It's definitely way too gorgeous to hide in shoes, and therefore I don't think it would ever become a pair of socks. So maybe a shawl? A cowl? Who knows? I'll admit that I didn't even look at this colourway even once while I was roaming around the booth. 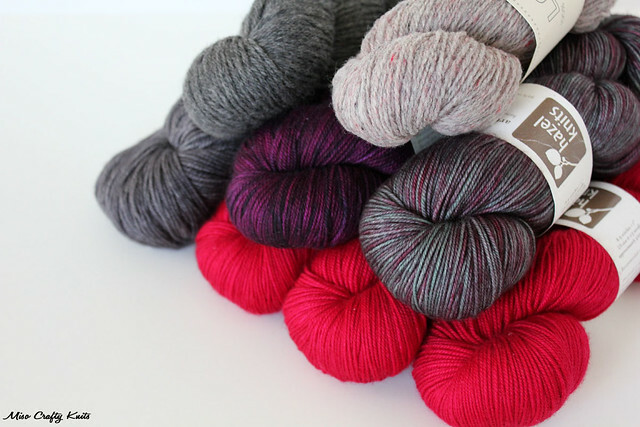 It wasn't until I was waiting in line to pay that I noticed a seriously stunning shawl draped over a dressmaker's form, and next to it on a table, a massive basket full of both the Entice MCN and Artisan Sock bases in this colourway. 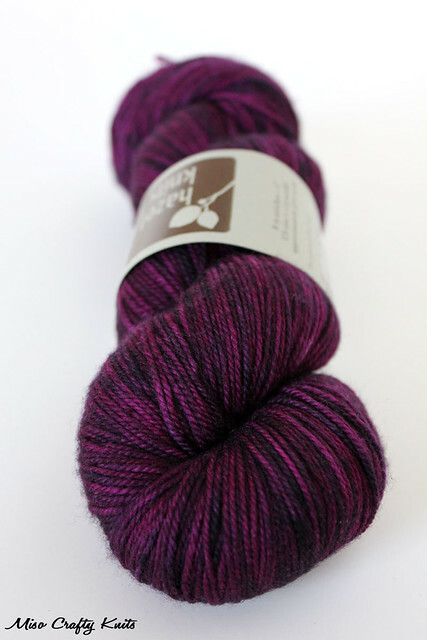 At first I had no intention of adding a skein to my purchase but after standing there waiting in line for so long, eventually a skein found its way into my bag. The next day when I hit up the Marketplace I had a bunch of enablers with me. Not that I needed any additional twisting of my rubber arm to buy more yarn! But I did walk away with more yarn from Hazel Knits. This time, a sweater's worth! Now, I have a confession to make here. This was another colourway that I kept walking over to and had to pet every single time I went past it, but only because I thought it was a very dark fuchsia! Even when I brought it back to the hotel and looked at it, I thought it was a dark pink. 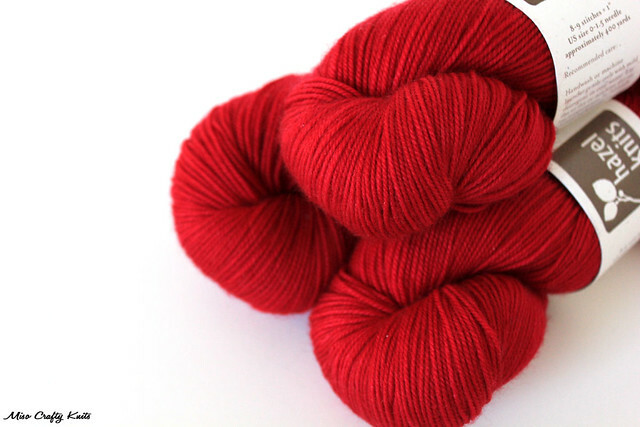 When I got back to Victoria and took the skeins out of the bag, I realized that they were actually a deep red! Unfortunately my camera hates red and can't pick up the fact that this is a red with blue undertones - which I'm so grateful for. I'm not a fan of nor can I pull off orange-y reds (they have a tendency to make me look sickly). Even though these skeins turned out to not be fuchsia, I don't regret buying them. I don't have much red in the stash and they make a beautiful addition. 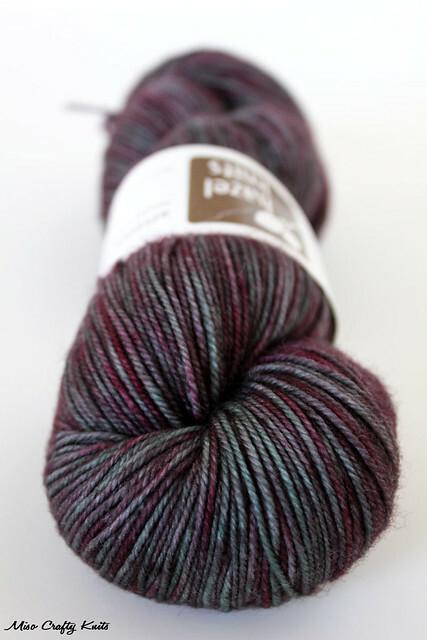 One yarn brand that I was definitely hoping to get my hands on was Anzula. I had never seen any of their yarns or projects made from their yarns in person. Aside from the occasional adverts in knitting magazines and random posts on social media, I hadn't even heard much about this brand. So I was definitely curious. Lucky for me the Stash Local booth had a nice selection of colours and bases and without needing to think about it, I grabbed a luxurious skein of Dreamy in a beautiful grey. For someone who thinks you can never have enough grey in your stash and wardrobe, I really don't have much of it actually in my stash. I have yet to find the right pattern to match this yarn, but trust me when I say I'm dying to knit it up! Although not new to me nor to my stash (and despite having issues the last time I tried knitting with this yarn), I also picked up a few skeins of Brooklyn Tweed Loft. I couldn't help it. Not only was the Postcard colourway a lovely mix of pink and grey, but I was kind of talked into it. But again, my rubber arm didn't really need any twisting. 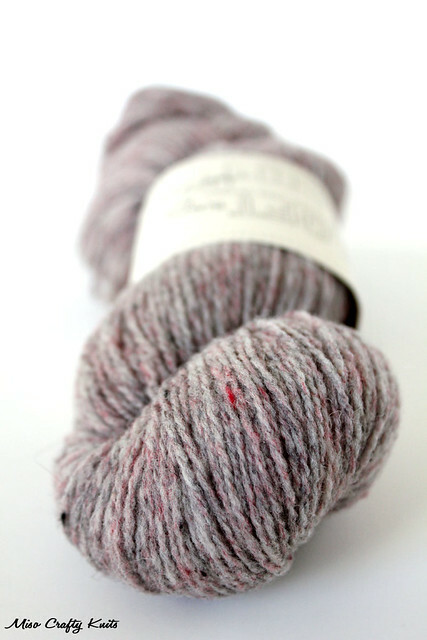 I originally wanted a sweater's worth of this colourway in Shelter so that I could knit up a Levenwick, but after a lot of thinking decided that if I were to ever get around to knitting a Levenwick that I would most likely want it in a smokey charcoal instead. So instead I picked up enough yardage to knit a shawlette with. Would you believe that's it for yarny purchases?? Shocking, right? I told you I held back a lot! I guess doing a mini inventory and round-up of the stash before heading to VK Live helped me from going crazy from yarn fumes. 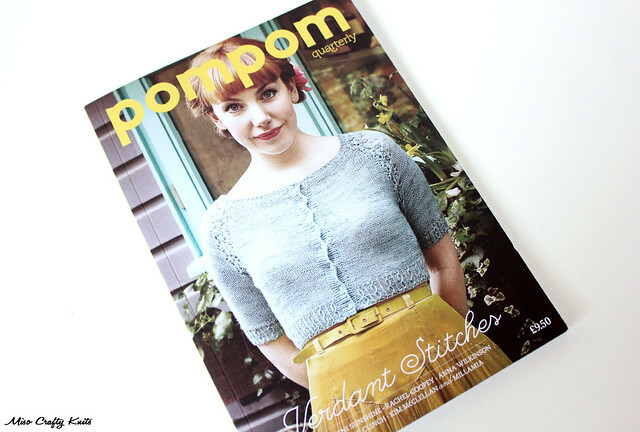 When Pom Pom made its debut last year, I was dying to get my hands on a copy. But then I discovered that the shipping from the UK would cost just as much as the magazine itself. Yeah...I couldn't justify spending that much on just one magazine, for 5 patterns. So I just continued to admire from afar. I obviously wasn't keeping up-to-date with Pom Pom, other than when new issues came out, cause I didn't know that they had offered digital copies on some of their issues. But truthfully, I like the aesthetics of the magazine and didn't think it would come through as nicely digitally. So when I saw that the Stash Local booth had a few issues for sale, I scooped up the latest issue (the Lobelia cardigan is just so darn sweet, how could I not pick this issue?). Look! Proof that I own a project bag that I didn't make myself! Ok, so it's not really a project bag per se, more like a portable yarn bowl in wristlet form. Hey, I'm all about supporting fellow knitterly entrepreneurs, and I didn't want to rip off the design/work in order to own one myself. I used this wristlet to help me knit up the second April Showers sock as I roamed around the house and once while at the playground. I also picked up a package of über cute pins from MochiMochi Land. Aren't they just adorable? I'm kind of kicking myself for not picking up a few kits, like the tiny unicorn, the tiny viking, and the gnome (I totally want an army of little gnomes to inhabit my dresser!). I just wish I had the patience to knit such tiny cuteness! They are seriously pure awesome-sauce! I don't remember if I've mentioned it here or what, but I was pretty hesitant about knitting with Addi needles again. 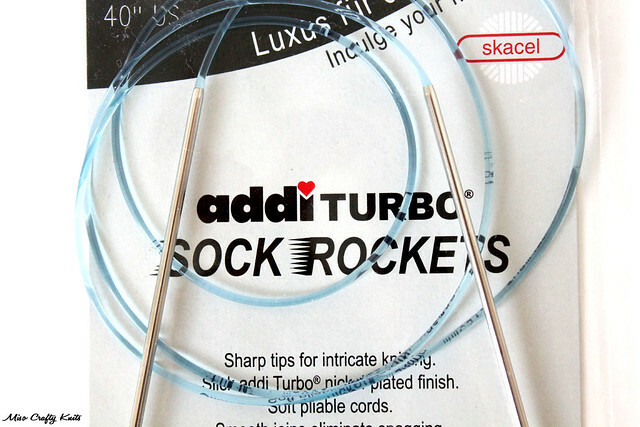 Mainly because I had a terrible experience with the Addi Turbo Lace needles that turned colours, gave off a stink, and made my hands and my knitting smell like dirty pennies. I know that not all Addi needles would have done that, but the experience was bad enough to turn me off. But hearing my friend Liisa's raving reviews and reading about them online, I decided to give Addi another try. I'm glad I did. I'm completely and totally in love with these needles!! More sock knitting will definitely be in my very near future now that I got these bad boys in my possession! 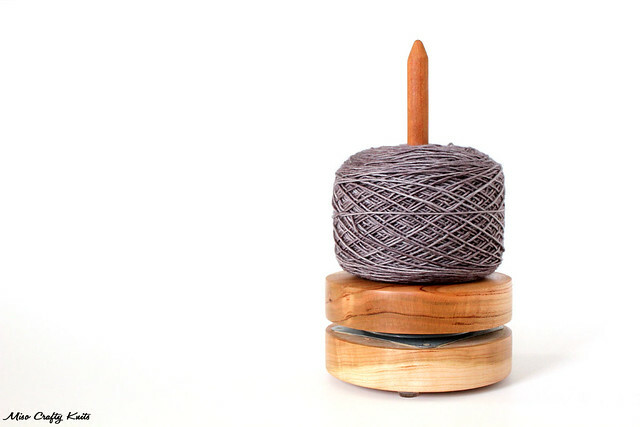 That's right, I found a wooden yarn caddy! I searched everywhere for one and while there were a few vendors selling them (and all from the look of it, all from the same company/man), I just didn't want to pay the $42 price tag. Why? Cause I really wasn't sure if I would use it enough to make it "pay for itself". My yarn bowl was around the same price but I knew that even if I didn't use it to hold my yarn cake while I knit, I could always use it as a pretty table decoration. Well, I guess luck was on my side because on the last day of the Marketplace I stumbled across a booth that I hadn't check out yet (the booth was jam packed full of bags of yarn, which I wasn't looking for) and saw hidden underneath a whackload of knitted samples a handful of yarn caddies!! The best part? The caddies were also by Sun Valley Fibers and they were $10 cheaper!! The cheapest that I've seen a yarn caddy go for was $25 but it either didn't have a spinning mechanism or it uses cheap materials to make it spin (like CDs). So $30 for the real deal? Oh yeah, one of these babies were definitely going to come home with me! I wish I had taken note of the shop's name but I didn't. The receipt didn't give any clues either. The ladies there were super nice and helpful, and even pulled out every single caddy they had so that I could take my pick. I was hoping for a nice dark wenge wood one but the one I saw wasn't "grainy" enough for my liking. Instead I took home this cherry wood one that has a bit of character to it. To say that I love my yarn caddy is an understatement. I've been using it for my Sleeping Beauty (Viajante) shawl and I seriously believe that the caddy is the reason why I'm making so much progress on it (I've already knit over 130 grams!!). It's great for marathon knitting - I literally park myself on the couch and will knit continuously without having to stop to unwind yarn or to deal with any sort of yarny mess. I know, I know, totally minuscule things that I've been doing pre-caddy days. But the caddy really has helped to speed things along. Poor yarn bowl. I'm sure I'll use you again soon. Well, there you have it. My VK LIve haul. See? Nothing special. But like many people have said before, any and all kinds of yarn hauls are exciting! What do you think? Ok, now it's time for me to start saving up my pennies for the next knitterly event...Fibrations in August and then the event of the lower mainland, Knit City in October (the Yarn Harlot is going to be there!!!). Oh yeah baby...I'm getting pumped! Hannah, you are SO lucky that Stash is your LYS!! Sonia and Liz are just so lovely! Oh! You are going to LOVE knitting the Anzula up. That stuff is sooooo glorious! 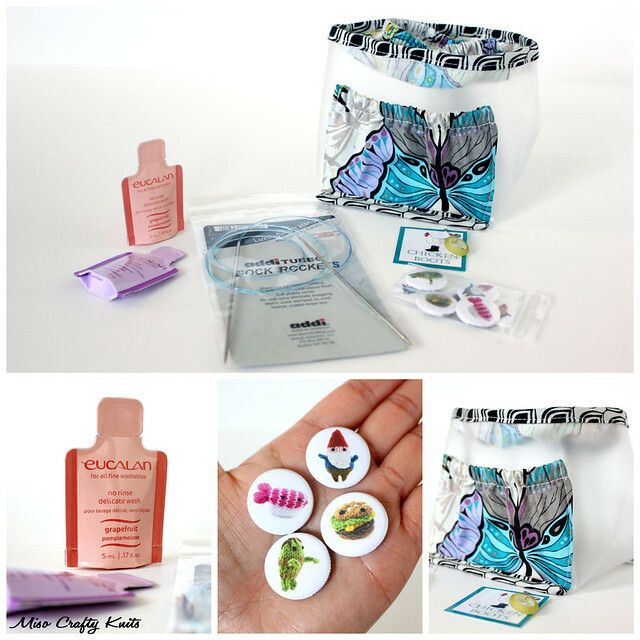 Oohh...what have you made with Anzula? I seriously can't wait to knit it up! I'm still on the lookout for the perfect pattern though! So who knows when I'll be able to work with it.